Baltimore Mayor Stephanie Rawlings-Blake ordered a mandatory curfew to be imposed on Tuesday night after a violent riot erupted in the wake of the funeral for Freddie Gray, a young black man who died in police custody over a week ago. Gray died as a result of severe injuries suffered in police custody. Escalating violence in the city pushed Rawlings-Blake to implement a week-long curfew, but one Baltimore woman took matters into her own hands when she found what many people believe to be her son ready to riot. 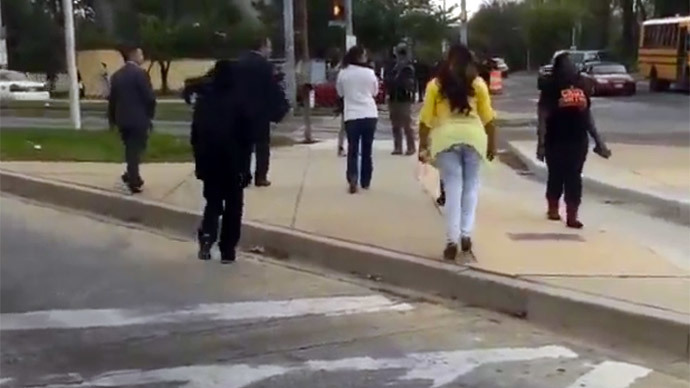 The final scene shows the son and mom, despite the distance between them, heading away from the riot together. The same day, Baltimore police asked parents to find their kids and get them off the streets. Under the curfew announced by Rawlings-Blake, no adults or minors will be allowed on the streets between 10pm and 5am from April 28 to May 5. Prior to the curfew announcement, Maryland Gov. Larry Hogan declared a state of emergency for Baltimore as violence erupted. The protests began around 3pm, as young people were leaving school and started throwing rocks and bricks at police officers. Some officers threw rocks back and police responded with mace and tear gas. Fifteen officers were injured. Since then, two-dozen people have been arrested and there has been massive looting and four separate fires in East and West Baltimore.